The user meeting hydro scheduling 2019 has come to an end. For two days, 13.-14. March, the users and developers of SINTEF Energy’s models was gathered at Hell. The days were filled with interesting talks from SINTEF and the model’s users. For the first time the user meeting was in English, which was well received. As the organizers and coordinator for the development of the hydro scheduling models it was heartening for us to see our colleagues present new functionalities and improvements in the models and see the positive reactions. Word cloud of what the participants though were the highlights of the event. The biggest news this year was the finishing of Version 10 for the long-term models, which was met with great interest. Version 10 represent the models biggest restructuring in several years. After what has been a longer and more challenging road than expected, version 10 is now ready for deployment. SINTEF Energy’s research scientist Knut Skogstrand Gjerden presents version 10 of the long-term models before an interested audience. Several of the presentations has pointed out the usefulness of the restructuring, both for the users and SINTEF Energy. For the users of the EMPS and EOPS models, version 10 opens the possibility of using the models in new ways. As an example, the new API gives the user an easier way to run the model with their preferences, it also enables better connectivity to other systems, and simplifies data entry and visualization of results. If this did not feel as a big enough treat for you, the API gives the SINTEFs developers improved tools, which means less time spend on routine tasks and more time for improving the models through research. The update will help us in the development of automatic systems for compiling, linking, testing and documentations of our models. The audience are listening to one of the many interesting talks. To make the process of introducing version 10 easier, SINTEF will help users convert data and get started with the new version of the software. There have also been important developments in the short-term models. SHOP has stepped away from case-defined test systems to using user-defined test systems, which makes it possible to facilitate more realistic and targeted testing of the tasks and systems were SHOP is applied. 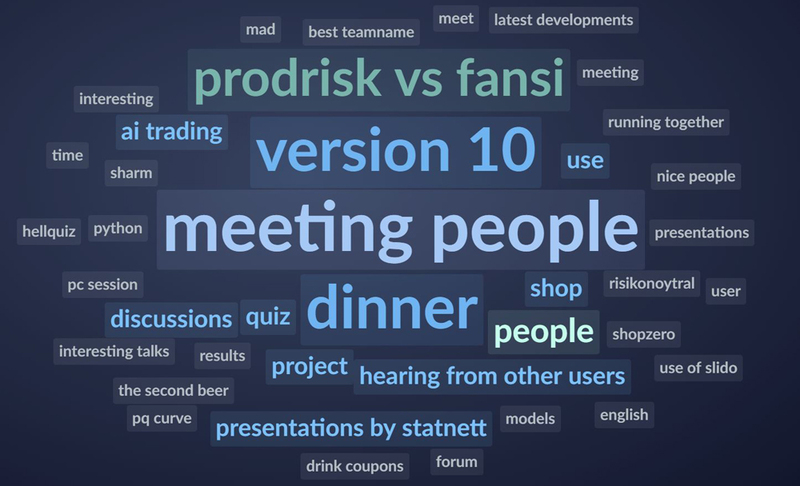 The feedback from the user meeting 2019 has been positive. Especially, the combination of presentations from SINTEF and industry partners is highly appreciated. In addition to an important platform for sharing the latest model developments, the user meeting has become an invaluable arena for sharing experiences and knowledge between the users. Several of the talks created a lot of involvement and generated a lot of questions from the audience, especially through the digital questioning platform Slido. 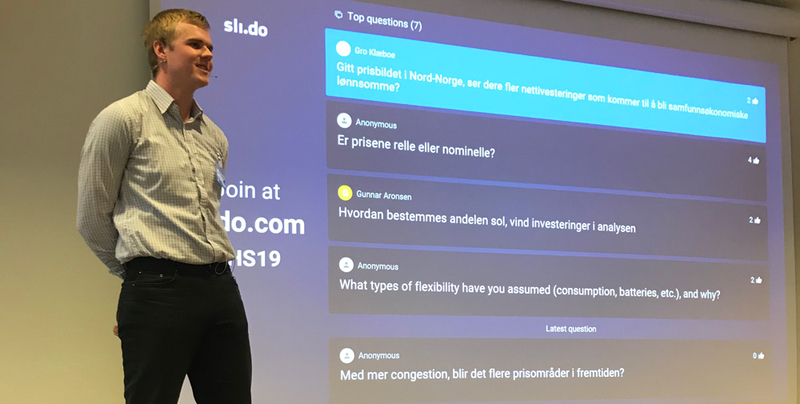 Analysts in Statnett, Vegard Holmefjord, received many questions via Slido for his presentation of Statnett’s market analysis for 2018-2040. 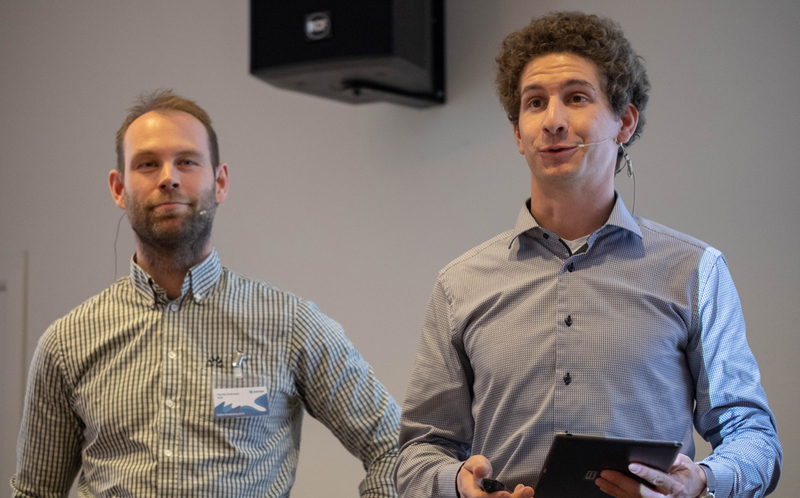 A popular presentation was from Valentin Koestler and Harald Endresen, NVE who presented results from a comparison study of the models Vansimtap (EOPS), ProdRisk and Fansi on single watercourses. As the word cloud in the first picture showed, networking is an important component of the event. It is through the good conversations and discussions we become closer and can build our knowledge. Both days had engaging discussions and questions from the participants. There were several breaks in the program to encourage discussions between the participants. Some discussions continued all through dinner and a somewhat unusual Quiz. For what is more fitting when you are in Hell, than a quiz with the theme Hell?